We’d love your help. Let us know what’s wrong with this preview of The Stories of Ray Bradbury by Ray Bradbury. Included here are famous tales like Sound of Thunder, in which the carelessness of a group of time-travellers leads to disastrous consequences, and The Veldt, in which two seemingly innocent young children transform their nursery into a lethal trap. Here are the Martian stories, tales that vividly animate the red planet with its brittle cities and double-mooned sky. Here are stories which speak of a special nostalgia for Green Town, Illinois, the perfect setting for a seemingly cloudless childhood - except for the unknown terror lurking in the ravine. Here are the Irish stories and the Mexican stories, linked across their separate geographies by Bradbury's astonishing inventiveness. Here, too, are thrilling, terrifying stories such as The Fog Horn - perfect for reading under the covers. Read for the first time, these stories are a feast for the imagination; read again - and again - they reveal new, dazzling facets of a master storyteller's extraordinary art. To ask other readers questions about The Stories of Ray Bradbury, please sign up. Bradbury's short stories are quick reads. The story starts from the very first sentence setting up minimal context and in most of the stories, he holds off on the punch line till the very end - the factor that changes the tone of the story completely. With this style in place and the way he titles the story, the narration is already half there. Witty, colloquial and often banter styled dialogues moves the stories very fast to an eventual conclusion. Even in this small space, he insists on start- Bradbury's short stories are quick reads. The story starts from the very first sentence setting up minimal context and in most of the stories, he holds off on the punch line till the very end - the factor that changes the tone of the story completely. With this style in place and the way he titles the story, the narration is already half there. Witty, colloquial and often banter styled dialogues moves the stories very fast to an eventual conclusion. Even in this small space, he insists on start-middle-end format that works to his benefit. The collection scatters across various genres, science fiction and fantasy being a constant recurring theme. Though themes vary, the characters remain utterly humane and almost every story is these humans salvaging sense of morality. Without an explanation as to why or how, Bradbury delves into wonderland of Science fiction especially involving time travel or some variant of it. Any story involving technology has elements of crime, dissolution of common sense and void of basic human emotions - be it building a robotic body double or finding a machine that makes people happy. When there are children involved, the theme is almost always adult and deeply disturbing - a baby that kills to a boy who lives with an entity that shape shifts. The underlying theme in this case however is juxtaposition of innocence and experience, and the knowledge that lies in the middle. Though Bradbury explores various themes and genres, the foundation of his stories always lie in everyday human emotions - relationships between various familial and social structures, parenting, friendships, alienation, ambition, survival, adaptation and so forth. The basic human emotions drive Bradbury's stories and aren't easily visible at a superficial glance. These stories make one think and feel entertained at the same time. When the theme of a story is examined in the context of the characters, familiar emotions can be recognized. The most enjoyable format to read a collection like this is to read a story or two everyday. With the number of short stories under his belt, there is enough to go around an entire year's worth. The Coffin: One of the best short stories I've come across in recent years. Bradbury manages to deliver a powerful story without indulging in banality of backstory. The Crowd: Minutes after a traffic accident, bystanders gather and discuss the nature of life's promiscuity and the jarring opinions that rip out of them without filter. The Scythe: A man tied to the scythe and as he harvests the ripe wheat in the field behind his house, all the souls that are neither living nor dead move out of their limbo. Made me wonder - is he moving the souls from limbo or is the scythe reason for their dying in the first place? There was an old woman: Only Bradbury can make death so funny. The Earth Men: Where "Martian Chronicles" began, in a not-so-cute meet-greet setting. The Fox and the Forest: A suspense thriller, a statement on war, a love story and sacrifices. All done in a span of 12 pages. Marionettes, Inc. : Bradbury mixes romance, science fiction and crime in a neatly packed little story which ends with a punch that's obvious with its arrival from the very first paragraph but still manages to surprise in the way it gets delivered. No particular night or morning: Bradbury's brand of existentialism. The City: The City, an anthropomorphic entity, avenges its people who were left in destitute by people of Earth during time of mass epidemic and eventual extinction. Its a revenge story is like no other. A sound of Thunder: Time machine, butterfly effect and end of rational thinking. The Fog Horn:Probably summary of every superhero story ever. A hero is as heroic as evil the villain is. Without a villain, what purpose does a hero serve? Skeleton:A fantasy-horror rendition of Stephen King's Thinner where a man loses his skeleton to a weird doctor for $2 after complaining about invisible bone aches. The Jar: The shifting tone of the story as short as it already is made a confusing start even more confusing and three pages later, I gave up. The Small Assassin: Before there was Children of the Corn, Child's Play, Chucky and plethora of other children based horror movies, there was Small Assassin. Excellent mood setting that plays on post natal exhaustion, new baby excitement and the overwhelming sense of responsibility that hits new parents when they take new born in their arms. The Happiness machine: Incredibly melancholic, the characters discover happiness through various moments of joy. Dark they were, and golden-eyed: Surprisingly charming with mutability of a species and the way nature, even in mars, forces adaptation on everything encompassing it. Including humans. Night call, collect: An intelligent way to address the paradox of contacting one's future self and dealing with the aftermath, RB narrates a stellar story of man on Mars contacted by his younger self who resolutely makes different choices than his future self, thus meeting another future self of his. Though it sounds complicated, narration is incredibly simple. All right... I'm not going to sit here and say I read this whole thing, because I didn't. However, I read the majority of it and from what I read, it was pretty good! Now, I'm not much of a short-story reader because I love getting to know characters and their backgrounds and whatnot's, and you just can't do that with short-stories. Regardless, there were a few really good one's in here that actually made me feel concerned for the characters. So that was cool. On the flip-side, there were a handful of stories that were not for me. And I mean they were so very boring - I almost felt like I was reading something dreadful for school. So yes, those particular stories are to blame for the non-whole 4 stars, because they were truly quite terrible. This has many good stories in it. although some are better than others. Some of the science fiction tales are still enjoyable while others haven't held up as well over time. For instance the stories set on Mars convey a feeling of desolation and insidious, insanity-inducing weirdness which still works for me, in spite of details which may have been proven wrong by subsequent scientific discovery. The Venus stories, on the other hand, are a little too out to left field: this planet is presented a This has many good stories in it. although some are better than others. Some of the science fiction tales are still enjoyable while others haven't held up as well over time. For instance the stories set on Mars convey a feeling of desolation and insidious, insanity-inducing weirdness which still works for me, in spite of details which may have been proven wrong by subsequent scientific discovery. The Venus stories, on the other hand, are a little too out to left field: this planet is presented as a giant hyperactive Amazonian rainforest. But many of the stories which take place down here on the home planet are just as interesting. There are a few recurring themes and it's interesting to see what Bradbury does with them. There is a preoccupation with machines which in later science fiction would be called androids, and these are used to explore what it is exactly that makes us human. There are people who get stuck in eternal youth, which, it seems, is not all it's cracked up to be. There is some exploration of deep-seated human depravity: children and even babies can be ruthless killers, teenagers harbour festering resentments and adults try to perpetrate the perfect crime. There are zombies, vampires and other monsters lurking on the fringes of society. It is possible to travel backwards and forwards through time, and even across dimensions--but let the traveler beware, for the results may be bizarre. Not all is doom and gloom, however. There are some light and funny stories, such as the one about the hen who lays oracular eggs, or the the one about the young man obsessed with chocolate. If you're into stuff like this, you can read the full review. There are two ways to look at the work of Ray Bradbury. One is to remember how it was: to return to the old friends of youth, when these stories were beautiful, perceptive and spoke of important things. The other is to look at them as they are now: elegant, but a little shallow; obvious; sentimentalized. To do the latter is to deny the child still w If you're into stuff like this, you can read the full review. There are two ways to look at the work of Ray Bradbury. One is to remember how it was: to return to the old friends of youth, when these stories were beautiful, perceptive and spoke of important things. The other is to look at them as they are now: elegant, but a little shallow; obvious; sentimentalized. To do the latter is to deny the child still within us. Not to do it is to deny the child's long struggle to become an adult. What to do? Bradbury peers quizzically out of the jacket photo, and, startlingly, displays a strong resemblance to James Thurber's customary expression. Cento racconti che non è possibile riassumere ed elencare come fosse una lista della spesa. Taglio, incollo e sistemo qui una parte dei numerosi appunti che ho preso in quasi tre mesi di lettura. Fantascienza, vampiri, fantastico, infanzia: ecco le quatt Cento racconti che non è possibile riassumere ed elencare come fosse una lista della spesa. Fantascienza, vampiri, fantastico, infanzia: ecco le quattro parole chiave che aprono questo scrigno contenente cento racconti dell’americano Ray Bradbury, classe 1920 e noto perlopiù per l’ormai classico Fahrenheit 451 . Un’autoantologia e, pertanto, una scelta fatta dall’autore stesso delle produzioni da lui ritenute più significative rispetto ai quattro temi citati. ” Ce ne sono cento, quasi quarant’anni della mia vita. Contengono metà delle verità sgradevoli sospettate a mezzanotte e metà di quelle gradevoli riscoperte a mezzodì del giorno successivo. Se c’è una cosa che in questo libro ho inteso fornire, questa è semplicemente la mappa della vita di un uomo che a un certo punto si è messo in viaggio verso una qualche meta, e poi ha continuato ad andare. La mia vita non è stata tanto il risultato di una serie di riflessioni quanto piuttosto di una serie di azioni che, una volta compiute, mi hanno permesso di capire che cosa avevo fatto e chi ero. Ogni racconto è stato un modo di trovare aspetti del mio io, ciascuno un po’ diverso da quello trovato ventiquattr’ore prima. I racconti sono, infatti, produzioni che vanno dagli ’40 agli anni ’80 ma nella raccolta non c’è ordinamento né cronologico né tematico e si possono dunque leggere liberamente. L’introduzione alla prima edizione dell’opera del 1980 (intitolata “Ubriaco alla guida di una bicicletta” ) è preceduta dall’intervista che Bradbury rilasciò nel 1976 al “Paris News” ma che non fu mai pubblicata a causa di alcune affermazioni che attaccavano il mondo intellettuale. Come si può definire la fantascienza di Bradbury? Dunque il pretesto di raccontare il futuro non è altro che un’analisi, una riflessione sul presente. Un racconto per me memorabile è IL CALEIDOSCOPIO (1949). Un incidente ad un razzo getta nello spazio gli astronauti (” come una decina di pesciolini d’argento che si dibattevano nel mare nero…”) e mentre cadono comunicano via radio (” Cadevano come sassi nei pozzi, dispersi come dadi buttati da una mano immensa, finché non ci furono più uomini ma soltanto voci.”). Terrore e rassegnazione. E’ la fine e man mano che ne prendono coscienza i ricordi trascorrono come un film e se, in un primo momento, prende il sopravvento l’istinto rabbioso ci si rende poi conto che la medesima sorte non può che generare comprensione…. Un altro racconto s’intitola La MACCHINA DELLA FELICITA’ (1957). Bradbury, anche qui, sfrutta la fantascienza per riflessioni esistenziali a largo raggio. Siamo in un’epoca in cui ci si poteva ancora immaginare di tutto: parliamo del ventennio tra il 1940 ed il ’60. Ventennio che contiene il boom economico degli anni ’50 dove è proprio la tecnologia la protagonista che agisce soprattutto sulla vita domestica che cambia nelle forme, nei contenuti e nei tempi. B., tuttavia, si chiede se tutto questo progresso possa aiutare l’uomo ad essere veramente felice. Ecco che in questa storia un padre di famiglia costruisce la macchina della felicità. Da notare che Bradbury non perde tempo nello snocciolare i meccanismi dei fantasiosi apparecchi che introduce nelle storie. L’importante è descriverne l’aspetto e le principali funzioni. Leo Aufman, munito di martello, chiodi e chiavi inglesi si dà da fare e costruisce questa scatola, una sorta di rifugio dove sperimentare la perfezione di un momento, di una giornata. Nessun dolore, preoccupazione, ansia o quant’altro ma solo una profonda serenità del vivere. Perché suo figlio e sua moglie escono dalla macchina piangendo come disperati? A queste domande la moglie risponde così: «Leo, l’errore che hai commesso è che hai dimenticato che a una certa ora di un certo giorno bisogna pur uscire da quella cosa e tornare ai piatti sporchi e ai letti da rifare. Finché sei là dentro, certo, un tramonto dura in eterno, l’aria profuma e la temperatura è perfetta. Tutte le cose che vuoi far durare, durano. Ma fuori, i bambini aspettano la colazione, i vestiti hanno bisogno di bottoni. E poi, per essere franchi, Leo, per quanto tempo si può guardare un tramonto? E chi vuole che un tramonto duri tanto? Chi vuole una temperatura perfetta? Chi vuole che l’aria profumi in continuazione? E poi, dopo un po’, chi se ne accorgerebbe più? È meglio un tramonto che duri solo un paio di minuti. Dopo di che, avremo qualcos’altro. La gente è fatta così, Leo. Come hai potuto dimenticarlo?» . I racconti del fantastico e del vampiresco (che non sono il mio genere) si suddividono tra ambientazioni misteriose dove aleggiano strane presenze, ad altre quasi comiche come ad esempio una serie di tre/quattro racconti che hanno come protagonista una gruppo di strani personaggi stile Famiglia Addams. Sul genere misterioso c’è un racconto del 1943 intitolato LA FALCE: una macchina con a bordo una famiglia che cerca un posto dove stare. Scappano dalla povertà e trovano una florida fattoria. Un uomo moribondo all’interno della casa dice che lascerà loro tutta la proprietà. Non possono credere a tanta fortuna e rimangono. Ben presto, però le cosa prendono una piega strana a partire da una falce che ha sul manico incise le parole: “chi mi regge, regge il mondo!” e poi un campo dove magicamente il grano ricresce poco dopo essere tagliato…. Un racconto che mette al centro l’ineluttabilità del destino. Essere bambini: una paurosa fatica..
Il tema dell’infanzia è molto emotivo. Legato agli incubi, le insicurezze, le paure incombe l’atmosfera notturna, il buio che nasconde l’ignoto. Oppure semplicemente la difficoltà dell’essere bambini e il non essere ascoltati e compresi. Il racconto che apre l’opera s’intitola LA SERA (1946). ” Si trovavano su un pianeta più vicino al sole. Le notti erano gelide, i giorni bruciavano come fuoco. Era un mondo violento, impossibile. La gente viveva nelle caverne per sfuggire alla morsa di ghiaccio e al giorno infuocato. Solo all’alba e al tramonto l’aria diventava respirabile, profumata…” . Non solo si è costretti a vivere nelle caverne ma la vita scorre molto più velocemente: dalla nascita si hanno a disposizione solo 8 giorni!! ”La nascita fu improvvisa come una coltellata. L’infanzia sarebbe finita in un lampo. L’adolescenza era un temporale breve e la vita adulta un sogno. La maturità era un mito, la vecchiaia una realtà cui era impossibile sfuggire e che durava poco, la morte un’improvvisa certezza.” . Quando Sim nasce i suoi genitori hanno solo qualche ora di tempo (” «Un’ora è metà della vita.») e poi moriranno. C’è una speranza, però: una navicella che si trova dall’altra parte del pianeta. I genitori al tramonto muoiono e rimane con la sorella. Continua a chiedere e a chiedersi Sim. Anche nella brevità del tempo a disposizione, la lotta per la sopravvivenza determina amici e nemici. Sim non vuole spendere quella breve vita nell’inerzia e si reca dagli odiati scienziati. Ma cosa si può fare in così poco tempo? It's been a long time since I remember reading the work of a writer who writes like no other person. So many writers are "like" Jane Austen, Mark Twain, Charles Dickens, Joyce Carol Oates, etc, and we read them because we've run out of the real thing. Ray Bradbury is only like himself. He puts things in a way no one else could put them. Primarily, his creativity and his prose glimmers real. He is the reason I was drawn to read in the first place: to visit other worlds. The story that blew me awa It's been a long time since I remember reading the work of a writer who writes like no other person. So many writers are "like" Jane Austen, Mark Twain, Charles Dickens, Joyce Carol Oates, etc, and we read them because we've run out of the real thing. Ray Bradbury is only like himself. He puts things in a way no one else could put them. Primarily, his creativity and his prose glimmers real. He is the reason I was drawn to read in the first place: to visit other worlds. “The essential impact of life’s loneliness crushes your beginning-to-tremble body. Mother is alone, too. She cannot look to the sanctity of marriage, the protection of her family’s love, she cannot look to the United States Constitution or the City Police, she cannot look anywhere in this very instant, save into her heart, and there she’ll find nothing but uncontrollable repugnance and a will to fear. In this instant it is an individual problem seeking an individual solution. You must accept being alone and work on from here." Vorrei ricordarmi quando ti ho conosciuto. Per alcuni autori che amo in maniera particolare è così: rammento il primo incontro, o almeno quello che mi ha fatto innamorare di loro. Con te no. Avrò preso qualche tuo libro in una bancarella dell’usato? O l’avrò trovato nell’alloggio dove andavo a passare le vacanze millemila anni fa? Oppure avevo letto qualcosa su un’antologia scolastica? Buio totale. Ma non è poi così importante; l’importante è che, dopo tanti anni, io abbia ancora nuovi tuo Ah, Ray! Ma non è poi così importante; l’importante è che, dopo tanti anni, io abbia ancora nuovi tuoi racconti da scoprire. Di racconti del buon Ray in questo librone ce ne sono cento; molti li conoscevo, tanti altri no. Non posso dire che mi siano piaciuti tutti allo stesso modo: molti sono belli, alcuni sono capolavori, parecchi sono geniali… qualcuno è un po’ stucchevole, qualcuno non mi è piaciuto per nulla. Ma come faccio ad assegnare meno di cinque stelline, a questa raccolta? Se non già per gratitudine e affetto e motivi puramente soggettivi, lo faccio anche per la sconfinata fantasia di quest’uomo, per la sua capacità di spaziare nelle emozioni, dal poetico all’inquietante. Sentirlo definire ‘scrittore di fantascienza’ è riduttivo (e pure ignorante): Ray Bradbury è ‘scrittore dell’animo umano’. I started reading this book nearly a month back. It is a chunkster at nearly 900 pages, but still I didn't think it would take so long. But I refused to give up or get distracted by other shiny new books, and I persisted. Yesterday, when I read the last word, on the last page, I was very happy and thrilled. I have always thought that Ray Bradbury was a science fiction writer. I hadn't read any of his stories or books when I thought that. Then one of my friends who was a huge fan of Bradbury intr I started reading this book nearly a month back. It is a chunkster at nearly 900 pages, but still I didn't think it would take so long. But I refused to give up or get distracted by other shiny new books, and I persisted. Yesterday, when I read the last word, on the last page, I was very happy and thrilled. I have always thought that Ray Bradbury was a science fiction writer. I hadn't read any of his stories or books when I thought that. Then one of my friends who was a huge fan of Bradbury introduced 'Dandelion Wine' to me. I read it and I loved it and it immediately found a place on my list of favourite books. It was the most beautiful evocation of summer that I have ever read. Then I thought that Bradbury wrote science fiction and stories about small-town America. Then someone told me about 'Fahrenheit 451'. Then I thought - "Okay. Bradbury writes science fiction + small town America + dystopia". Then I read this book. And now I realize that whatever I thought about Bradbury was wrong. He was a writer who refused to get slotted into one genre, refused to be pigeon-holed. He wrote about anything and everything which caught his fancy and he defied other's attempts to classify his stories. This book has 100 stories, all selected by Ray Bradbury himself. There is science fiction, there are stories of small town America. But there are also horror stories, stories about vampires, dinosaur stories, noir crime stories, detective stories, murder mysteries, love stories, family stories, Irish stories, Mexican stories. Even the science fiction is diverse - the regular space travel stuff is there, there are Martian stories, there are time travel stories, there are stories of dinosaurs and strange sea creatures, and other stories which are hard to classify. There are science fiction stories which offer commentary on our modern networked world in which we are connected all the time through social media. Bradbury wrote that story decades back, before the advent of the smartphone and the internet, and the insights the story offers are amazing. This story is called 'The Murderer'. The Irish stories show beautiful aspects of Irish culture and how people took pleasure and got happiness from the small things when their country was going through a tough time. My favourite Irish story was 'The Anthem Sprinters'. There were many stories which bore a close resemblance to longer novels by other authors and movies, which came later. I am wondering whether these authors and movie makers were inspired by Bradbury's stories. 'The Small Assassin' looked remarkably similar to the movie 'The Omen', but without the religious connotations. I liked most of the stories in the book and it is impossible to write about them all. So, I am giving below a brief description of some of my favourites. "You realize you are alone. You and your mother. Her hand trembles. Your belief in your private world is shattered. You feel Mother tremble. Why? Is she, too, doubtful? But she is bigger, stronger, more intelligent than yourself, isn't she? Does she, too, feel that intangible menace, that groping out of darkness, that crouching malignancy down below? Is there, then, no strength in growing up? no solace in being an adult? no sanctuary in life? no flesh citadel strong enough to withstand the scrabbling assault of midnights? Doubts flush you." Homecoming - There is a strange family who look like humans during normal times. We are never told what they are, but we suspect that they are vampires. They are having a great gathering and celebration and all their relatives are visiting. There are all kinds of creatures among their relatives. The youngest member of the family, Timothy, is different from the rest. He sleeps during the night, is awake during the day, eats normal food. How this outsider lives his life in a family filled with people who have strange powers forms the rest of the story. The Scythe - It is a story in which a man and his family, who are struggling to make ends meet, find a house in the middle of nowhere, with everything they want, and a document which says that the house and surrounding lands belong to them now. But, of course, nothing comes for free in life, and there is a deep horror lurking there in the house and around. Kaleidoscope - A rocket explodes and the astronauts inside are thrown out in different directions. They have a short period of radio time left, before they lose contact, and in that time they start discussing the meaning of life and they start saying nice things and mean things to each other. What starts as a science fiction story, ends up becoming a story which asks the big questions about life and it is incredibly beautiful. The Veldt - A couple get a futuristic playroom for their kids. But when the playroom door is closed, it looks like something scary has stepped into the room, like a real life version of 'Jumanji'. The Fire Balloons - A group of priests go to Mars to meet Martians and initiate them into the ways of religion. But they are in for a surprise. Hail and Farewell - A beautiful story of a boy who doesn't grow up. The Great Wide World Over There - A story of a middle-aged woman who can't read and write, who discovers the pleasures of receiving letters. Very beautiful. I cried after I read the story. The Small Assassin - A story about a newborn baby who is fully aware of his surroundings, doesn't have any moral sense of right and wrong, hates his parents for bringing him into the world, and tries to hurt them. Very scary. Very similar to 'The Omen'. Calling Mexico - A story about an old man in his last days, who tries to bring back his past with a small act. Very beautiful and poignant. The Day it Rained Forever - A story about three old men who are waiting for the rain and then something happens. You have to read the story to find out what happened. The Town Where No One Got Off - A travelling salesman gets off the train, one day, at a town where no one gets off. Surprising things happen then. A very interesting, philosophical noir crime story. The Anthem Sprinters - A beautiful depiction of Irish culture. The Terrible Conflagration up at the Place - a story about a few young men who want to burn down an Irish lord's house. What happens is beautiful and charming. Tomorrow's Child - A couple have a child. But the child has an unusual appearance (can't tell you more). What happens after that - you have to read and find out. A beautiful story about parents and children, family and love. I Sing the Body Electric! - in which the narrator talks about his unusual grandma. She is one of my favourite grandma characters ever. A Story of Love - a beautiful, unusual live story. The Better Part of Wisdom - another beautiful, unusual love story. What is left unsaid is so beautiful. I don't think I would have understood this story when I was in my teens. Interval in Sunlight - it describes the life of a couple and how the husband harasses the wife everyday, with every word he speaks. It made me angry more and more as I read the story. I hated that husband character. But the way Bradbury makes it all look so real - it is scary. Full marks to him. Ray Bradbury is my favorite author. His use of descriptive language and non-conventional character development and plot are what makes him to be one of the best science fiction writers of all time. The Stories of Ray Bradbury captures the very essence of what makes him so brilliant. The book features a methodical mix of both long and short stories that give the reader great choice. A Bradbury short story can take anywhere from fifteen minutes to an hour to read. Bradbury, more than any other auth Ray Bradbury is my favorite author. His use of descriptive language and non-conventional character development and plot are what makes him to be one of the best science fiction writers of all time. The Stories of Ray Bradbury captures the very essence of what makes him so brilliant. The book features a methodical mix of both long and short stories that give the reader great choice. A Bradbury short story can take anywhere from fifteen minutes to an hour to read. Bradbury, more than any other author I’ve ever read, paints a picture in my mind about the events in the book. He, more than any other author I’ve ever read, leaves the reader completely satisfied with the visual and sensory aspects of the story while at the same time leaving us begging for more of his quirky, deliciously flawed characters. I cannot recommend this book highly enough. His ability to apply his signature style to each story while maintaining complete individuality for each one is unprecedented. Bradbury can say more in a short story than most authors do in an entire novel. This is a masterful collection. The epitome of the classic. It deserves to be in every library, to be cherished forever. The Lake is one of the saddest stories i have ever read and it came back to haunt me in my dreams. I can clearly see the influence that Bradbury has on Neil Gaiman. Highly recommended! These stories are SO GOOD. I'm more of a science-fiction-is-a-metaphor-for-our-times reader than a lightyears-and-technology science fiction reader, and I didn't know what to expect. Stylistically, his writing is just beautiful. Many times, I caught my breath at a turn of phrase, a heart-wrenchingly familiar characterization, a sentence that makes you go "ooh," and then you stop and read it over again. As for the science fiction aspect--you can't really pigeonhole Ray Bradbury, the man was a storymaking machine. So, yes, in this book, people land on Mars, but it's what they do once they get to Mars that makes the story matter to us. He creates situations familiar to us from our lives, or from the headlines; he writes about the loneliness and isolation of being far away from home, about being forced into exile, about being the last person left on the planet. But these are also stories about hope and family and friendship, even if they are often flavored with the anxiety of the nuclear age. There were stories that made me think, stories that made me smile, and there were stories that made my the hairs at the back of my neck rise and stand at attention. An old housemate I had scratched with an indelible marker a paragraph out a story called Kaleidoscope on his bedroom wall. He showed me this gigantic book. I read the story. Men were drifting into the oblivion of space as it began. One of the men told the captain how he had betrayed him, and now there was nothing either of them could do about it. Another struggled to fasten the valve on his wrist because a meteor had calmly ripped away his left hand. One man had gone mad An old housemate I had scratched with an indelible marker a paragraph out a story called Kaleidoscope on his bedroom wall. He showed me this gigantic book. I read the story. Men were drifting into the oblivion of space as it began. One of the men told the captain how he had betrayed him, and now there was nothing either of them could do about it. Another struggled to fasten the valve on his wrist because a meteor had calmly ripped away his left hand. One man had gone mad on impact while another nearby sacrificed precious energy to reach him and put a hole in his glass face. When the story begins, you learn immediately every character is doomed to die. I was feverish as I read. Dialogue ensued through a shared channel that some wished they could shut off, and words heated their tempers as everything drifted further and further. I was locked in from then on. The Master died this week, and the world is a lesser place. I have a list of people who should never have been allowed to die, and now Ray Bradbury joins Leonard Bernstein, Victor Borge, and Jim Henson. I bought this book in 1983, and I bought a second copy to give to my best friend. When I married her in 1989, suddenly I had two copies in my possession! Here is magic. Bradbury made magic when he wrote. He could bring tears to my eyes for sheer beauty. Read "The April Witch". Read "The Picasso Sum The Master died this week, and the world is a lesser place. I have a list of people who should never have been allowed to die, and now Ray Bradbury joins Leonard Bernstein, Victor Borge, and Jim Henson. Here is magic. Bradbury made magic when he wrote. He could bring tears to my eyes for sheer beauty. Read "The April Witch". Read "The Picasso Summer". If you're ever depressed and think life not worth living, "The Wonderful Ice Cream Suit" will pull you all the way to joy. Did you ever fall in love with a teacher? "A Story of Love"
Afraid of death? "The Leave-taking" Or its delightful, whimsical opposite, "There Was an Old Woman"
Here is horror. "Gotcha! ", "The Coffin", "The Skeleton", "The Screaming Woman", "Boys! Raise Giant Mushrooms in Your Cellar!" Just pick up anything by Bradbury. What an imagination that man had! And how he could write! Aldous Huxley was right--Bradbury was a poet. There may have been other Bradbury anthologies since this huge (100 stories!!!) 1980 collection, but I sincerely doubt any could be half as fine as this one. This is the ultimate collection of Bradbury's short fiction including nearly every important tale from this seminal American writer. It also includes a terrific introduction by the author titled "Drunk, and in Charge of a Bicycle". Probably my favorite single book of all time...this specific edition. No filler or lesser works in sight. Pure gold. I'm not really sure how to even start with a review of this book, with its table of contents stretching to three pages. And even taking three months to read it was too short a time. Bradbury shorts need to be read slowly and savoured. I binged a bit here. There are Martian stories in this collection, there are Mexican stories, Irish stories, stories about the supernatural Family and the joys of childhood. There are the famous stories (A Sound of Thunder, The Fog Horn etc) and so many more. There a I'm not really sure how to even start with a review of this book, with its table of contents stretching to three pages. And even taking three months to read it was too short a time. Bradbury shorts need to be read slowly and savoured. I binged a bit here. There are creepy stories of childhood and children (exemplified by The Small Assassin) and stories of the joys. Stories of happy marriage and stories showing it falling apart in slow motion. Every aspect of human life is examined by Bradbury in this collection and turned into a gem. Some stories are better than others (I really didn't like Interval in Sunlight very much, for example) but taken as a whole, there's no denying the power of Bradbury's work. I have not yet finished this book, but feel that some commentary is needed on it. I have been reading this book for about 3 years now. I find that when I read too many short stories in a row, I begin to think of them as separate chapters in a connected book, and don't pay the proper attention to each story as its own entity, so I force myself to read a couple then set the book down. I can easily start argum I have not yet finished this book, but feel that some commentary is needed on it. I can easily start arguments with people over Bradbury being the pinnacle of short story author ever. I love short stories as an art form. I believe Bradbury is a master of them. I believe that Gaiman is also a master, as was Zelazny. Man, I love Ray Bradbury. I really, really do. But I couldn't get through a lot of the stories in this collection. Too many choices, maybe? It's a honkin big book. Maybe these were mostly B sides? I didn't recognize a good many of them. Not in the right mood, perhaps? Entirely possible. 2 stars. But I don't blame Bradbury. I blame myself. Ray Bradbury's stories are always timeless and brilliant. I've never read anything like them in my entire life. Ler esse livro em qualquer outro momento da minha vida não teria sido a mesma experiência. Dentre os contos destaco "O Lixeiro", "A Autêntica Múmia Egípcia Feita em Casa" e a "A Cidade Inteira Dorme". I don't remember exactly when it was that I started this book (10 to 12 months ago, in all likelihood). Like all short story collections, this needs to be enjoyed slowly. And like all such collections, some stories will be more interesting than others, depending on the reader. So in a collection such as this one - with one hundred different stories - everyone is sure to find something to like. In my case, there were twenty-nine stories that I really liked, a handful that I disliked and couldn't w I don't remember exactly when it was that I started this book (10 to 12 months ago, in all likelihood). Like all short story collections, this needs to be enjoyed slowly. And like all such collections, some stories will be more interesting than others, depending on the reader. So in a collection such as this one - with one hundred different stories - everyone is sure to find something to like. In my case, there were twenty-nine stories that I really liked, a handful that I disliked and couldn't wait to finish, with the rest scattered somewhere in-between 'Really Liked' and 'Ugh'. Mr. Bradbury is my favorite author and always has been. I recommend reading his short story collections individually but this compilation is my all-time favorite. It contains the story, “The October Game” which seems to be becoming harder and harder to find. Overall great selection and phenomenal anytime reading. Simply the quintessential Bradbury collection of short stories. Some are better than others, but by and large all are good, with some being so fabulous that you remember them always. A must for anyone who loves to read. Kandidat att ta med till en öde ö (eller öde planet i det här fallet). Som i alla antologier är inte alla nummer lika bra, men Bradbury har en mycket hög lägstanivå. Ren fröjd att läsa. Sometimes an author relates to you in such a way that you feel its impossible. Like he's inside your brain, tinkering with clockwork gears and machinery, the stuff that makes you tick. That accurate. That close to home. When I picked up this book, the same one with that terrible 80's coverart, I'm sitting in a library, leafing my way through the enormous (and ridiculous) science fiction section. Science fiction, to me, had always seemed a little ridiculous. Not that I disliked it as a genre, bu Sometimes an author relates to you in such a way that you feel its impossible. Like he's inside your brain, tinkering with clockwork gears and machinery, the stuff that makes you tick. That accurate. That close to home. When I picked up this book, the same one with that terrible 80's coverart, I'm sitting in a library, leafing my way through the enormous (and ridiculous) science fiction section. Science fiction, to me, had always seemed a little ridiculous. Not that I disliked it as a genre, but some stories lacked weight, humanity. Then I find this. So I've heard of this guy from Stephen King's horror essay/book/memoir Danse Macabre, and so I decided to see if he was any good. I mean, heck, he even earned a special mention in a list of authors King dedicated the book to. Standard and stellar sci fi/horror fare, I figured. This was stellar. So I sit down right, and open the book. Obviously its a short story collection, so I turn to the most attention grabbing title. Naturally, I turn to "The Skeleton". And goosebumps have never risen on my neck like that in a looong time (last time was when I read Poe's Tell Tale Heart at 3 am). The last words leave you reeling, gasping for more. And, well, gasping in general cause it's just that visceral. I could write whole pages on my favorite stories, such as "The Lake" (one I felt a deep connection with odd enough), "Homecoming", "The Fog Horn", "The Cistern", "The Sound of Summer Running" (which turned out to be a chapter in his other wonderful book Dandelion Wine, which is fantastic), etc. If they aren't in this book, well heck, they're Bradbury, and they should be, and you should read them. It just might give you a new appreciation for art. It might even give you some encouragement. Or, heck, even better, it just might change your life. "Farewell summer. Grandpa said it. Grandma looked it. Douglas felt it. Like Christopher Buckley, who wrote the introduction to this collection of stories, I also discovered Ray Bradbury when I was young. I think that Bradbury’s stories are destined to appeal to a certain type of young reader, one with poetic sensibilities, a feeling of melancholy and a hidden interest in the macabre. Revisiting his stories as a more mature reader, I think they lose a little of their magic. The twist endings are not as surprising and the homey 1950’s Americana is less palatable, unl Like Christopher Buckley, who wrote the introduction to this collection of stories, I also discovered Ray Bradbury when I was young. I think that Bradbury’s stories are destined to appeal to a certain type of young reader, one with poetic sensibilities, a feeling of melancholy and a hidden interest in the macabre. Revisiting his stories as a more mature reader, I think they lose a little of their magic. The twist endings are not as surprising and the homey 1950’s Americana is less palatable, unless it is viewed somewhat ironically. That being said, there are still many unexpected pleasures, especially when you dive into an 1050 page masterwork. The Onondaga County Public Library system only has one copy of this large book, which I cruelly pried away from another reader by requesting it. I was in terror lest someone else request the book, so I resolved to read all 1050 pages as quickly as possible. The result was an immersive Bradbury experience that only barely let up for work and sleep. Bradbury’s writing became the background to my life. Is it any surprise I had a few more nightmares than average during those three weeks? I have physical, tangible memories of this book. I know I read it first in summer because I remember exactly how it felt to go from the humidity and heat outside into the almost too cool air of my town library. I remember also walking behind the central circulation desk rather than turning left, starting to look at books for adults and older readers rather than the children's/young reader books I was used to. I remember finding this on the shelves and looking up specifically "I Sing the Body Ele I have physical, tangible memories of this book. I know I read it first in summer because I remember exactly how it felt to go from the humidity and heat outside into the almost too cool air of my town library. I remember also walking behind the central circulation desk rather than turning left, starting to look at books for adults and older readers rather than the children's/young reader books I was used to. I remember finding this on the shelves and looking up specifically "I Sing the Body Electric!" because I had seen a version on television and loved it. That story made me cry, while "The Veldt" frightened me terribly and "The End of the Beginning" thrilled me. I read "Homecoming" and remember having so many different thought I couldn't talk about it. Every word was both profoundly right and wrong and it encapsulated a sad-loving-strangeness I still find difficult to explain. Bound in this book are the total gamut of emotions and reasons we read any form of fiction, shot through with the joy and excitement of stories well told. This book belongs on every bookshelf in every home and library. A couple of years ago, I was wandering through the annual book sale held by my town's library when I found this treasure. It only cost me $2. 884 pages of short stories for $2! A steal. A crime! This collection of 100 short stories from 1943 to 1980 has been a joy to read. I've been able to re-connect with old favorites and discover new (to me) ones. It's like stepping back in time, to when the library stacks were tall and hallowed. In this collection you'll find a wide variety of stories spanni A couple of years ago, I was wandering through the annual book sale held by my town's library when I found this treasure. It only cost me $2. 884 pages of short stories for $2! A steal. A crime! 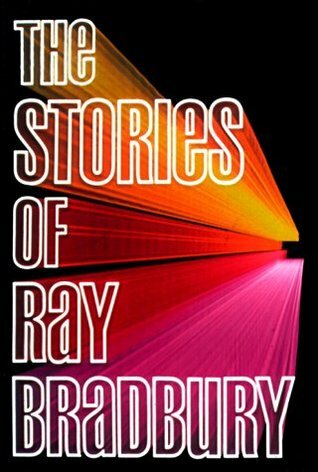 In this collection you'll find a wide variety of stories spanning Bradbury's career. You'll get the spooky stories that wound up in Weird Tales at the beginning of his career, a whole host of pulpy sci-fi from the dawn of the Space Age, and many more that explore the human condition with its immersion into suburbia and taking its first steps out among the stars. Bradbury was one of the best authors of the 20th century. You'd be hard pressed to find another author who best captured what it was like to be alive during his time, from the wonder of a child to the dark murderous thoughts of the wicked. If you can find a copy of this book, grab it. Ray Douglas Bradbury, American novelist, short story writer, essayist, playwright, screenwriter and poet, was born August 22, 1920 in Waukegan, Illinois. He graduated from a Los Angeles high school in 1938. Although his formal education ended there, he became a "student of life," selling newspapers on L.A. street corners from 1938 to 1942, spending his nights in the public library and his days at Ray Douglas Bradbury, American novelist, short story writer, essayist, playwright, screenwriter and poet, was born August 22, 1920 in Waukegan, Illinois. He graduated from a Los Angeles high school in 1938. Although his formal education ended there, he became a "student of life," selling newspapers on L.A. street corners from 1938 to 1942, spending his nights in the public library and his days at the typewriter. He became a full-time writer in 1943, and contributed numerous short stories to periodicals before publishing a collection of them, Dark Carnival, in 1947. His reputation as a writer of courage and vision was established with the publication of The Martian Chronicles in 1950, which describes the first attempts of Earth people to conquer and colonize Mars, and the unintended consequences. Next came The Illustrated Man and then, in 1953, Fahrenheit 451, which many consider to be Bradbury's masterpiece, a scathing indictment of censorship set in a future world where the written word is forbidden. In an attempt to salvage their history and culture, a group of rebels memorize entire works of literature and philosophy as their books are burned by the totalitarian state. Other works include The October Country, Dandelion Wine, A Medicine for Melancholy, Something Wicked This Way Comes, I Sing the Body Electric!, Quicker Than the Eye, and Driving Blind. In all, Bradbury has published more than thirty books, close to 600 short stories, and numerous poems, essays, and plays. His short stories have appeared in more than 1,000 school curriculum "recommended reading" anthologies. Ray Bradbury's work has been included in four Best American Short Story collections. He has been awarded the O. Henry Memorial Award, the Benjamin Franklin Award, the World Fantasy Award for Lifetime Achievement, the Grand Master Award from the Science Fiction Writers of America, the PEN Center USA West Lifetime Achievement Award, among others. In November 2000, the National Book Foundation Medal for Distinguished Contribution to American Letters was conferred upon Mr. Bradbury at the 2000 National Book Awards Ceremony in New York City. Ray Bradbury has never confined his vision to the purely literary. He has been nominated for an Academy Award (for his animated film Icarus Montgolfier Wright), and has won an Emmy Award (for his teleplay of The Halloween Tree). He adapted sixty-five of his stories for television's Ray Bradbury Theater. He was the creative consultant on the United States Pavilion at the 1964 New York World's Fair. In 1982 he created the interior metaphors for the Spaceship Earth display at Epcot Center, Disney World, and later contributed to the conception of the Orbitron space ride at Euro-Disney, France. Married since 1947, Mr. Bradbury and his wife Maggie lived in Los Angeles with their numerous cats. Together, they raised four daughters and had eight grandchildren. Sadly, Maggie passed away in November of 2003.